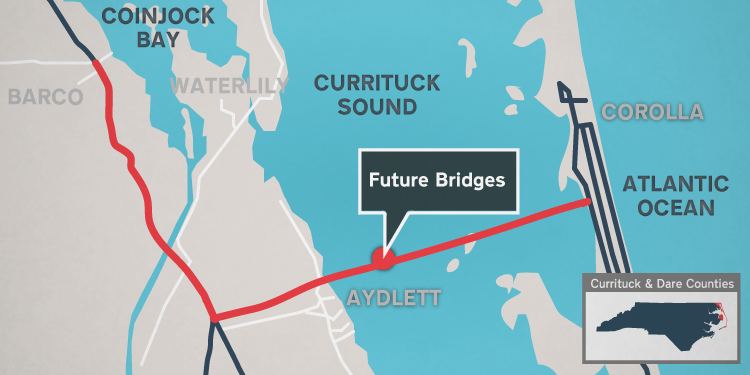 The Mid Currituck Bridge will improve access and mobility to energize and connect our regional economy. The bridge will address the critical safety and evacuation needs of our residents, businesses and guests who visit the Currituck Outer Banks. From a "quality of life" perspective, our visitors will be able to save roughly up to 2 hours of travel time to reach the Currituck Outer Banks which means... more time spent on the beach! And from an economic development perspective, the bridge will provide investment and development opportunities for the mainland that will help expand the tax base, increase job opportunities and expand our access to goods and services. The Mid-Currituck Bridge project will create a second crossing of the sound – north of the Wright Memorial Bridge – to help alleviate congestion and improve the flow of evacuation traffic in the event of a hurricane or severe storm. Currently, the only highway crossing of the Currituck Sound along the North Carolina coast is the Wright Memorial Bridge on U.S. 158 at the southern end of Currituck County into Dare County. It will also provide easier access between the Outer Banks and Virginia, as well as other communities in northeastern North Carolina. There is not an estimated toll rate at this time. 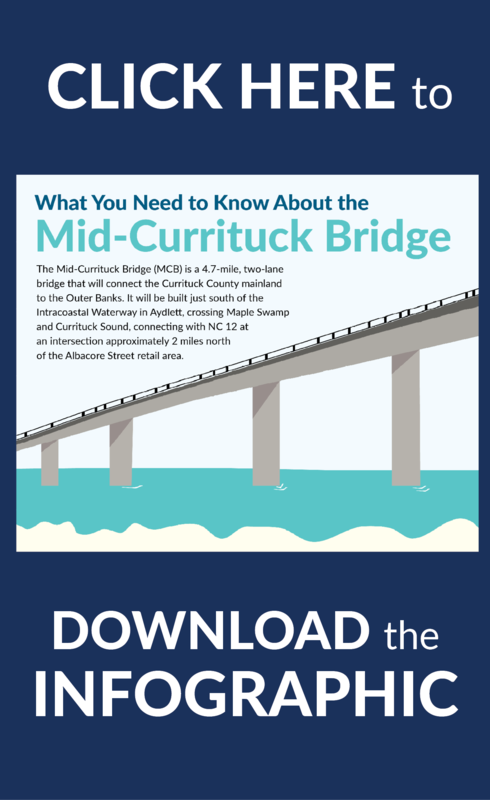 The Mid-Currituck Bridge will substantially reduce evacuation times from the Outer Banks for residents and visitors who use US 158 and NC 168 as an evacuation route. The bridge will provide much faster transport times for Currituck Emergency Medical Services’ ambulances and a more direct route for police officers to respond to 911 calls. The MCB will reduce the severity and duration of traffic congestion on summer weekends. According to the Record of Decision, the length of the congested period would drop from 13 to 15 hours to 7 to 12 hours. Benefits to mainland Currituck County could include a boom in retail, restaurants and hospitality. The MCB could spur a mix of commercial and business development similar to that in Dare County in the area surrounding the bridge.